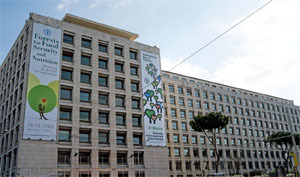 FAO headquarters, Rome. March 2013At FAO headquarters in Rome, Italy, an opening ceremony and technical seminar was held entitled Forests in the Landscape Context and provided updated country-based and technical information on the ways in which forests can maximize landscape products and services. The publication Forests and Water – International Momentum and Actionwas launched during the seminar. This event was webcast in English, French and Spanish at www.fao.org/webcast. In conjunction with the Third Mediterranean Forest Week, the Day was launched with a press conference, release of the publication State of Mediterranean Forests and tree planting activities in Tlemcen, Algeria.